Your home’s roofing bears the full brunt of the sun’s rays on sunny days. Being such an abundant source of free energy, it makes sense to harness the sun’s unlimited power. As solar technology continues to advance, more and more homeowners are taking advantage of this power and installing solar panels. As a primer on solar energy, State Roofing shares below how solar panels gather energy for your home’s consumption.Solar Cells: Harnessing the Sun These semiconductors consist of conductive materials such as silicon. When sunlight strikes these materials, the resulting chemical reactions cause the release of electric currents. A device, like a battery, stores this energy for your household’s use. Nonetheless, you should understand that it’s not as simple as putting solar modules on your roof. Not every roof is angled correctly to fully reap energy from the sun. There is, for instance, a reason they put solar panels on the roof instead of on the siding.Solar PV System: Storing and Utilizing Power Photovoltaic systems, commonly known as PV systems, are simply batteries to which all the resultant electricity is stored. These systems have very few moving parts and, as such, require very little maintenance. Still, it’s always better to have professional contractors install them and take care of subsequent issues so you can make the most of your investment. This way, you’ll stretch your savings for years to come. Why let all that renewable energy go to waste? Switch to solar roofing now and watch your savings go up. We are familiar with many types of Solar Roofing installations. 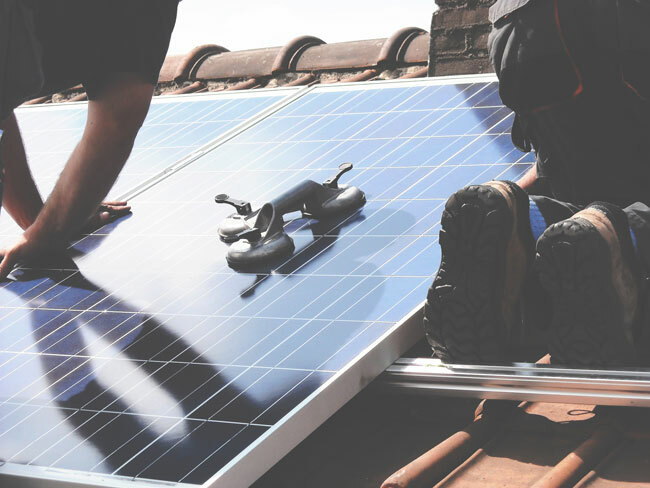 We have installed solar panels ourselves in the past—but currently we work in conjunction with many of the major solar installation companies in the area. If you are thinking about solar—and in need of a new roof—call us and we can talk about the process! If your roof is in need of replacement in the near future—it is best to install the roof before you install solar panels. Solar panels can be installed on top of virtually any type of roofing—composition, flat roofing, rubber roofing or metal roofing.. We have a unique SR-150 standing seampanel that allows the solar panels to clamp onto the taller “ribs” of this roofing system and dramatically reduces solar panel installation penetrations in the new roof. We have worked seamlessly with many of the local solar installation companies to install a new roof–followed by new solar panels—and we would love to work with you! State Roofing, Inc. is the premier name in quality roofing services. We operate in Bellevue, Kirkland, and Seattle, WA. We’ve been in business since 1968. Call us today at (800) 810-7305 for more information about our products and services.